At the base of the Drill Tower is a sub-surface Confined Space Simulator. 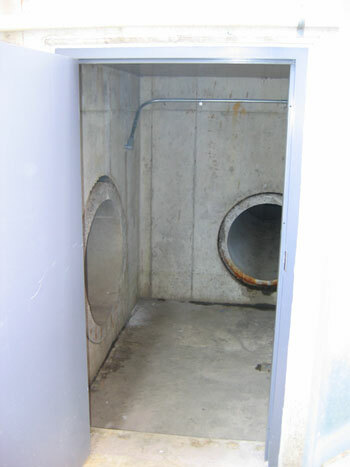 The C-Space simulator consists of four concrete vaults interconnected with concrete pipe. The interconnecting pipes are various sizes and are at different elevations. The main vault is accessible from the exterior stair tower of the Drill Tower with all remaining vaults having access via manholes on top and interconnecting pipes. All vaults are lighted with emergency lights. In addition to the Confined Space Simulator, the Silo section of the Water Tower can be used for numerous Confined Space simulations.